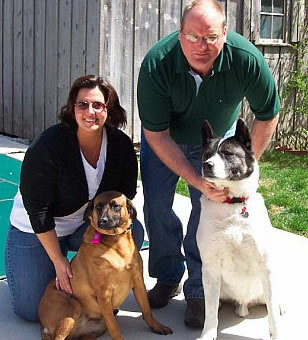 The Cape Cod Dog is owned and operated by Katrina Boucher. We are located at 3 Main St., Unit 1, Eastham, MA 02642. On September 1, 2004, we opened our little shop and have made so many new friends, Canine and Feline!! While visiting our shop you will find specialty items for dogs and cats. We have the best selection of Gourmet Dog Bakery, as well as a selection of Collars, Leashes, Toys, Treats, Accessories, Beds, Pet Clothing, Supplements and Natural Foods. Our unique logo features a dog whose tail is shaped like Cape Cod. You can find him on T-Shirts, Sweatshirts and Hats. Wet noses always welcome, but MUST be leashed. Be sure to stop in and say hello, get a biscuit and a belly rub on your next visit to beautiful Cape Cod. Not you silly, the dog! Our space is limited, so our web-site features only a small selection of items you can find in our shop. If you can not find it on our site, give us a call at 508-255-4206 or drop us an E-mail at katrina@thecapecoddog.com. If we have it, or can get it, we will be happy to ship it to you. Check back frequently, as our selection may change. Thank you for shopping at The Cape Cod Dog.